Most people are probably familiar with the story in Matthew 14. It’s the story where Jesus walks on the water. It was just before the break of dawn when Jesus walked on the water towards the boat were the disciples spend the night crossing the Sea of Galilee. At first they thought it was a ghost and they started to fear. Jesus called out to them, “Be of good cheer, it is I; do not be afraid.” Peter was the first to react, I think maybe with a little bit of doubt asking Jesus, “Lord if this is You, command me to come to you on the water.” Jesus answered, “Come”. So Peter stepped out of the boat and onto the water. I wonder sometimes when I read that passage, what must have gone through Peter’s mind that very moment, realizing that he was actually walking on water? Peter stepped out in faith and was walking towards the Lord. As the story goes on, Peter got very afraid seeing the boisterous wind and the waves coming towards him. He became fearful and started to sink. He cried out to Jesus, “Lord save me.”. Jesus immediately stretched out His hand and caught him. After this Jesus said to Peter, “O you of little faith, why did you doubt?”. I think Jesus said this with a little chuckle. Why did Peter have fear and doubts? He stepped out in faith and walk a short distance on the water before he started to drown. I think the reason is because Peter took his eyes off the Lord. His faith turned into fear. Instead of believing Jesus Who said to him “Come” he became fearful. Fear and Faith are mutually exclusive. Faith and Fear cannot co-exist. The one cancels out the other. One cannot have faith and fear at the same time. 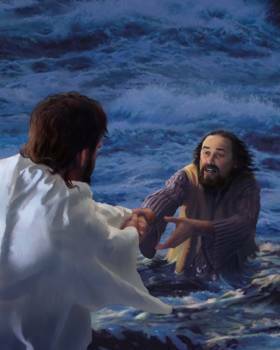 That’s what happened to Peter, he was walking on the water and the moment he took his eyes of Jesus, he started to sink. The lesson we can learn from this is to keep our eyes on Jesus. As long as we stay focused on Jesus and do not fear whatever wave or storm may come our way, we will not sink as Peter did. The world is full of fear and doubts, people are scared about the economy, geopolitical events and many other things in their daily life’s. We as believers in Christ should not fear or doubt. We can firmly stand on God’s word and His promises. We cannot please the Lord by fearing. Jesus said many times, “Fear Not!” The Bible says in Hebrews: “..looking unto Jesus, the author and finisher of our faith….” Heb 12:2. Looking onto Jesus… Without Jesus we can do nothing and without faith, it’s impossible to please God. Let us keep our eyes on Jesus, He is the shinning light unto our path. “Be anxious for nothing, but in everything by prayer and supplication, with thanksgiving, let your requests be made known to God; and the peace of God, which surpasses all understanding, will guard your hearts and minds through Christ Jesus.” Phl 6:4. Me too, these are some tough days living in this world and I believe it can only get worse. Fear Not! Very good post, I needed that.